The "Stripes" company restaurant is an integral part of the extension of the Adidas "Herzo Base" HQ, located at a former barracks in Herzogenaurach. Starting from a terrace overlooking a lake, the transparent construction follows the topography of the hill over several levels. Glass façades, glass roof and different sized beams give the visitor the feeling of being outdoors, rather than in an enclosed spaces. As part of the roof structure, MICROSORBER® ensures optimal acoustics in this place of rest. The architects have installed the micro-perforated film for achieving its climate concept: the roof is a double wall construction, inner printed film with rear ventilation doing double duty protection against the sun and heat mirror in combination with cooling floor. 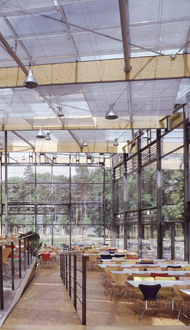 The MICROSORBER® panels are stretched between the light grid on which the horizontal glass coating and the primary support structure is placed. The corners are covered with splices and connected by balancers.